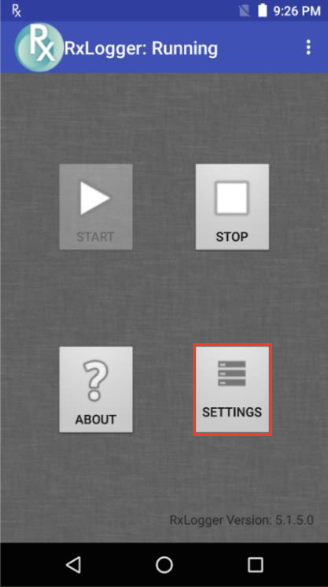 Controls collection of data from Android's "application not responding" (ANR) events. Event data is copied directly from the Android system and saved in a file called trace.txt or some variant thereof. For example, the ANR event for a post-loaded app would be similar to trace-<app_package_name>.txt. The Kernel module captures kmsg data from the Android system and outputs it to a series of numbered files (i.e. KLog0.txt, KLog1.txt, KLog2.txt) with 0 being the newest. Module options allow data from any or all enabled buffers to be stored in separate files or in a single combined file. Output is stored in a series of numbered text files (i.e. Main0.txt, Main1.txt, Main2.txt) with 0 being the newest. Custom logcat filter to run on the main buffer. Custom logcat filter to run on the event buffer. Custom logcat filter to run on the radio buffer. Custom logcat filter to run on the system buffer. Custom logcat filter to run on the crash buffer. Custom logcat filter to run on the combined buffer. The Long Term Storage (LTS) module gathers log files generated by other active modules and stores them together for device health and behavior analysis over a period of time. Module output files are compressed with gzip and stored in the specified path, which is appended as shown below. Multiple stores in a single hour (noted in military time) are numbered from 00-99. The Qxdm Module captures Qualcomm Modem Logs from the device, which are read using a Qualcomm utility. 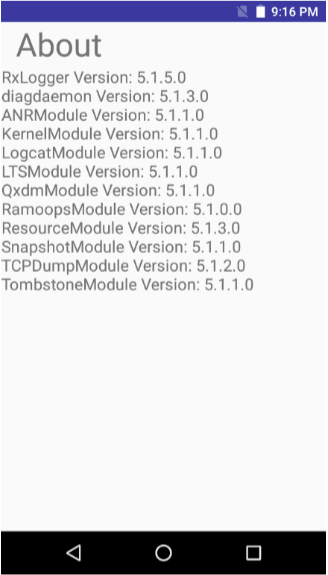 This module also accepts a user-defined configuration file generated by Qualcomm tools and stored in the <RxLogger_Path>/qxdm/cfg/Custom_filter.cfg folder. Warning: Output from this module consumes all available storage space if the log size parameter is left unspecified. Zebra recommends specifying a log size in accordance with available storage. Captures the last kmsg from the device, writing it to persistent memory immediately prior to a system crash. Ramoops outputs text files generated by the system at boot or after a kernel panic. These files contain raw kmsg data from the boot immediately prior to the crash. More about Ramoops. Captures device information and system statistics at specified intervals to determine the health and behavior of device resources over a period of time. Outputs collected metrics as a series of comma separated values stored in files with a .csv extension. Captures device information and system statistics at each "moment in time" to determine the health and behavior of device resources over a specified period. Outputs a single text file containing collected metrics for selected parameters for each specified interval. Though similar to the Resource module in function, Snapshot captures more precise data, including threads and dumpsys details along with a device fingerprint header for each file. Snapshot creates one text file per data collection set containing with the output of all enabled data selections. Captures packet data for all device network connections and outputs a binary file that can be read with Wireshark and other standards-based network analysis tools. Collects the Android native crash logs from the device, which contain stack traces and other details about the crashed process. Tombstone files are output in sequence starting with tombstone_00through tombstone_09 and starting again with tombstone_00. Use timestamps to determine the most recent files.